Recently I had the pleasure of getting out with a friend who has taken an interest in all things fishing. He's quick to learn and adapt as well as eager to fish for anything and everything. There really is no better species to start someone off through the ice than the yellow perch, so that was where we would start. 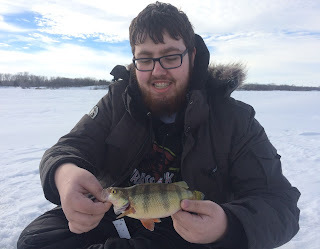 It's been a wild winter weather wise this season and at the beginning of our last mild spell we hit a well known reservoir to try for some perch. It is not known for trophy sizes but typically makes up for it in numbers. With temperatures above zero, shelter and heat weren't needed (although sunscreen would have been a good idea). 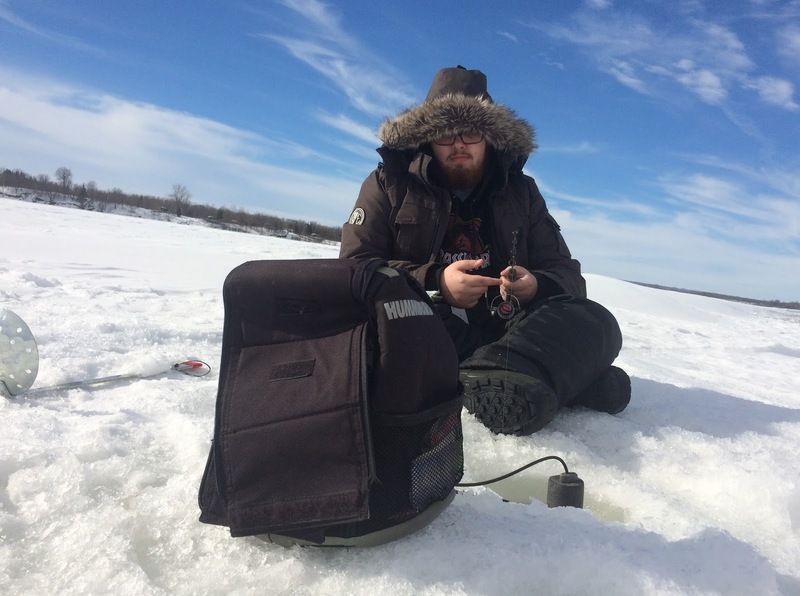 We set up the shack as a home base and I drilled about a dozen holes in an area around it then we got to work jigging up perch. My first drop down and I hooked in to a feisty pike, I spent the next three minutes fighting it only to have the hook catch on the bottom of the ice and the pike escape. The action was consistent all morning and as lunch rolled around it came to a peak. Dozens of perch were landed with about one in ten being worth the time to fillet. 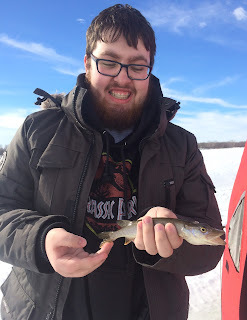 Will was able to jig up his first northern pike and while it was tiny, it will be an easy one to beat. He was happy with a new species and can't wait to get out and target a larger specimen. The weather was stellar, action steady and a new fisherman is well on his way to developing skill and passion for this great sport.